5 Best longbow reviews (Updated 2019): Revealed by Longbow Experts! Are you searching for best longbow for hunting or target shooting? when I bought my first longbow years ago, I burned my money on the wrong longbow. Which resulted in inaccuracy and inconvenience while shooting the bow and arrow. But over time I have cracked the process to choose suitable and perfect longbow which made my hunting experiences more fascinating, and I want to help you as well so you can get optimum results. that’s why I have created a list of Amazing longbows and reviewed it, it took us almost three days to review and came up with top rated longbows for money. How to choose the best longbow for hunting? Note: Reviews of all longbows are totally unbiased and personally tested, so you can buy it without even thinking twice. At 68 inches long, this bow is an excellent choice if you’re looking for excellent comfort. The weight draw available is anything between 35 and 55 pounds, and it’s made of the best quality materials that make for its stability and smoothness. The riser of this longbow is made of two different kinds of wood: Makore and Cassia Siamea, the combination of which makes for a longbow like few others. And as if this wasn’t enough, the limbs are made of strong fiberglass and Maple laminations, ensuring the durability of the longbow and also its reliability. The grip of this longbow was designed in a way that it accommodates all sizes of hands. Long gone are the days when the grip on your favorite bow was either too small or too big, the Sas Pioneer Traditional Wood Longbow is designed to fit in your hand, no matter its size. All of the materials, along with the elegant, timeless design, come together to assure a high-performance longbow. Its accuracy is impressive, as is its power. Every time you’ll use it will be a new experience, and it will be even better than the last. No tools needed for setup of the bow. Once mastered it can be used for bowhunting. It’s made to last thanks to the high-quality materials used in its design. The Custom grip that adapts to any hand size. Available only for the right hand. 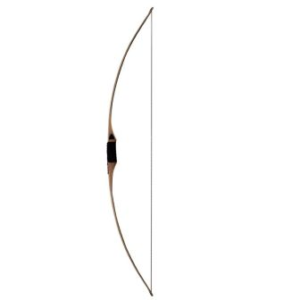 This longbow was first launched in the 1990’s, and since then it’s become very popular. It has a slightly reflexed design, with 64 inches AMO length and between 30 and 65 pounds of draw weight for the right hand and 45 to 55 for the left hand. The recommended brace height is between 7½ and 8½ inches. It can be used for hunting or just practicing, and it can handle practically any weather condition. If money is the issue then you can by used bear Montana longbow on eBay. This bow might look simple, but it’s anything but. Although amazing for beginners, it offers the stability and speed experienced archers are looking for as well. This is something you want to be searching for every bow, and Bear Archery doesn’t disappoint. Using Maple wood and fiberglass to protect the limbs and further reinforce the tips, along with adding a soft leather grip, will make your bow last and always feel as amazing as it did the first time you shot it. Bear Archery also uses its signature FutureWood technology, which is the result of a process that gives any wood in the handle section new physical traits that prevent the wood from cracking or warping. Easy to use, which makes it great for beginners. Amazing value for money it is one of the cheap longbows for its quality. It’s powerful and probably fastest longbow yet so you don’t have to worry about your arrow not being fast enough if what you want to use it for is hunting. It’s smooth and quiet, which makes it great for hunting, as well as for target archery. Some customers report that it can be a bit hard to draw. The leather grip might be a bit disappointing. It’s not cheap, but it’s not of the same quality as the other materials used to make the bow. Another great option to consider is the Mountain Man Sierra Longbow 68”, made of Walnut and Hard Maple woods and has a custom finish. 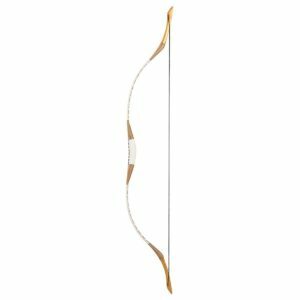 As the name implies, it is 68-inch longbow bow, it has between 40 and 60 pounds of draw weight, and the brace height can be anything between 6½ and 7½ inches. It is a multipurpose longbow, that can be used for nearly all activities that require a bow and arrows, whether it is hunting or it is target shooting it works amazingly. As mentioned, the Mountain Man Sierra is made of Walnut and Hard Maple, but the real secret of its materials is that this wood is handpicked to assure the bow is easy to handle and made to last. In addition to that, Hard Maple has known also as “Rock Maple” and makes for a solid and very powerful bow. The limbs are made of fiberglass and its tips are additionally reinforced to assure durability and high performance. The accuracy of this bow is exceptional. The vibration and hand shock are practically inexistent, it’s easier to control than other longbows. Not all bows can be used with all strings out there. This specific longbow is compatible with the Fast Flight string, a string made to be faster and transfer more energy to the arrow than others. Another reason why this compatibility is so great is the fact that the Fast Flight string doesn’t stretch. Available for left and right handed archers/bowhunters. There are virtually no complaints about this product, it gets as close as perfect as a longbow can get. if budget is your problem and you can’t afford above bows then flagella horse can become you pick for hunting and target shooting. Available range for draw weight is between 30-60 which is sufficient for any kind of archery activities. you can blindly trust the manufacturer because they have earned this reputation by delivering quality products for years. It doesn’t matter whether you want to hunt coyote, deer or turkey with it you can get your desired draw weight. The bow is lighter than other bows which will be helpful if you are on the hunt and carrying it all day and night, It is easy to carry that’s why most of the women hunter’s are in love this bow. A powerful longbow which is silent as well. 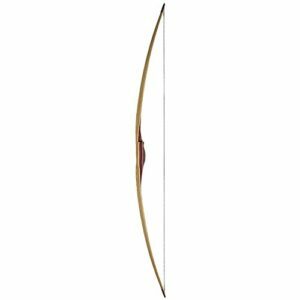 This longbow modern longbow and one of the best ones currently available. It has a draw weight between 40 and 65 pounds, a brace height between 6½ to 7½ inches and AMO Length of 62 inches. It is reflex longbow and every bow is handmade, which makes all the difference in the world. The riser of the bow is reinforced with silver and accented with Zebrawood, which also laminates the entire length of the limbs, except the reinforced limb tips. Basically, due to the fact that the riser of the bow cannot absorb the movement of the long limb, you’ll notice a so-called hand shock every time you shoot an arrow with most of the longbows out there. The Savannah Stealth is made in a way that the hand shock is practically inexistent, making it that much easier to shoot. When buying a Savannah Stealth, you can be sure that you’ll get an excellent quality longbow which will assure you the best performance and maximum comfort, mainly thanks to the reflex/deflex technology implemented in the bow. There’s no stacking, the release is practically incomparable and the draw stroke is amazing. Every Savannah Stealth longbow is handcrafted out of the best materials to make your experience superb. The riser is made of Bubinga with some Zebrawood highlights, and the limbs are made of Bubinga and covered with Zebrawood. Clear glass is used to top the limbs and black fiberglass at the tip overlays. Comes with a Flemish bowstring. It comes with a bow sock to protect it. It’s one of the most visually appealing longbows out there. Since it’s handmade, it might be out of stock or the waiting time can sometimes longer than desired. It is on the pricier side. But the quality and experience it provides make it worth every penny. Last, but not least, if you’re still not entirely convinced by any of the other longbows, there is another amazing option for you to consider – the Longbowmaker White Handmade Longbow. At first glance, this longbow stands out thanks to its color, but it’s so much more than just a pretty white bow. It’s available for draw length from 20 to 110 pounds, and the draw length can be anywhere between 27 and 33 inches. The body is 54 inches long despite the bow being quite thin, this doesn’t affect the overall performance. It is not common to find commercial longbows that can handle such weight. It is something that would definitely be very interesting for anyone trying to find a longbow that can handle a lot of draw weight but is not at the point of having one custom made. This longbow is made of different materials: the grip is made of pigskin, the riser of Beech, and the limbs are made of wood and covered in fiberglass. All of these materials together make for a high-quality longbow that will last you a long time. The design and the materials come together to provide an excellent experience to any archer. The overall performance, accuracy, and absence of hand shock included, is outstanding, and it’s the reason behind the excellent arrow speed, making this bow perfect for hunting as well. The color is really beautiful and special. 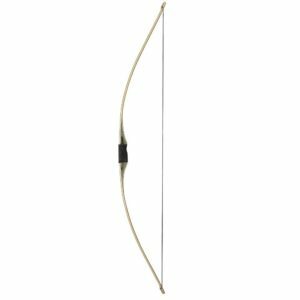 If you’re looking for a higher than usual draw weight, this longbow can go as far as 110 pounds. Made only of the best materials. Smooth draw and no stacking. Some archers report that there is a little bit of hand shock at higher draw weights. Some find the string that comes with the bow of not such great quality. Longbows have been around literally for millennia.The oldest longbow that was ever found dates all the way back to 3,300 BC on the border between Italy and Austria, and since then it’s made its way all around Europe and even became the English go-to weapon for wars and also hunting.It’s a beautiful piece of equipment if you’re passionate about archery or bow hunting, and would like to have the same experience our ancestors had all those many, many years ago. When you see a longbow, you immediately understand where the name came from (if you need a visual reference, Robin Hood, as portrayed by Kevin Costner in the 1991 movie, was using a longbow). It is, in fact, long. It were usually about as high as the shooter and made of wood. It looks rather simple, but don’t be fooled, it can give you an excellent shooting experience. We should look for following things while selecting the highest quality of longbow for hunting. Longbows can be used for practically any archery-related purpose, but the Olympics. Depending on what your chosen discipline is, you’ll want to research different options or consult with a professional when it comes to choosing your longbow. For example, if what you’re interested is field archery, the best longbow for you can be different from one for bowhunting or traditional archery. In case you’re not entirely familiar with the term, Brace height is the distance between the deepest part of the bow and the string and it matters most to increase the speed with which the arrow is shot (lower brace height, higher arrow speed). Many times, when you ask about the perfect brace height, you might get an answer like, “The one that helps you shoot at your best.” This sounds like a ridiculous answer to a very specific question, but in time you’ll see that whoever gave you this answer, was right. However, when choosing the first one, one of the recommendations out there is to go for 1/12 of the bow’s height and then adapt according to your necessity and preference. Draw weight, the amount of weight your pull when drawing a bow, and draw length, the distance between the throat of the grip and the nock point, are two measurements you should know when choosing a longbow, or any bow for that matter. When it comes to longbows the weight usually changes with your draw length – for every inch of a product’s draw length, you have to take into consideration a +/- 2½ pounds. It’s one of the first things that you’ll be asked when trying to help you find the best choice, one that will fit you perfectly and will help make archery or bowhunting fun and exciting for you. As mentioned, a longbow is essentially made of two elements, the bow, and the string. There are no additional elements, so you want to make sure that the quality is superb. Traditionally longbows were made of yew wood, but nowadays you can find them made of other types of woods or materials as well. With only these two elements, the longbow can be more fragile than other, more modern longbows, therefore it’s extremely important that you make sure that the bow you decide to buy will not be destroyed after just a few archery or bowhunting sessions. you may be wondering that who are the best longbow makers here is your list. 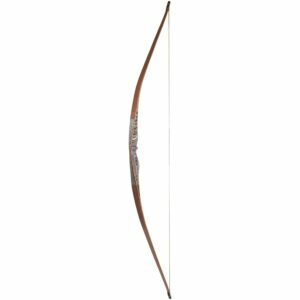 What are the Best longbow brands or makers? Buying a low price longbow might seem like a good idea when you’re leaving the store, but most likely you’ll soon regret it. When it comes to having a bow made of a piece of wood and a string, you want it to be of the best quality possible, so it doesn’t get destroyed a few shots in. And, yes, quality costs. We are in no way encouraging you to spend all of your hard-earned money on a longbow, especially if you’re a beginner. However, you do need to realize that buying a good longbow has its cost and if you’re serious about taking up archery or bowhunting, you should be ready to spend a little extra. These 5 longbows are of the best that are currently available on the market. Most of them are suitable for both beginners and advanced archers and can be used for target archery, traditional archery, hunting, basically anything, but the Olympics. Some might seem a bit pricey, but the truth of the matter is that the quality you’ll be buying with any of these longbows has been tested and approved time and time again by archers of all sorts around the world. Besides, one of the main features all of these longbows share is durability, which means that what you spend will last you a long time as long as you take good care of it. Using a longbow is definitely an experience like few others when it comes to archery or bowhunting. We’ve done our best to focus on why you should give longbows a chance, what to pay special attention to when choosing your first (or next) longbow, and reviewing 5 different products, their main features and pros and cons, to help you make the best and most informed decision possible. Whatever you decide, just always make sure you’re buying good products and do your very best to always stay safe when handling a bow and arrows.